Here's the quickest way to get started with camelcamelcamel. 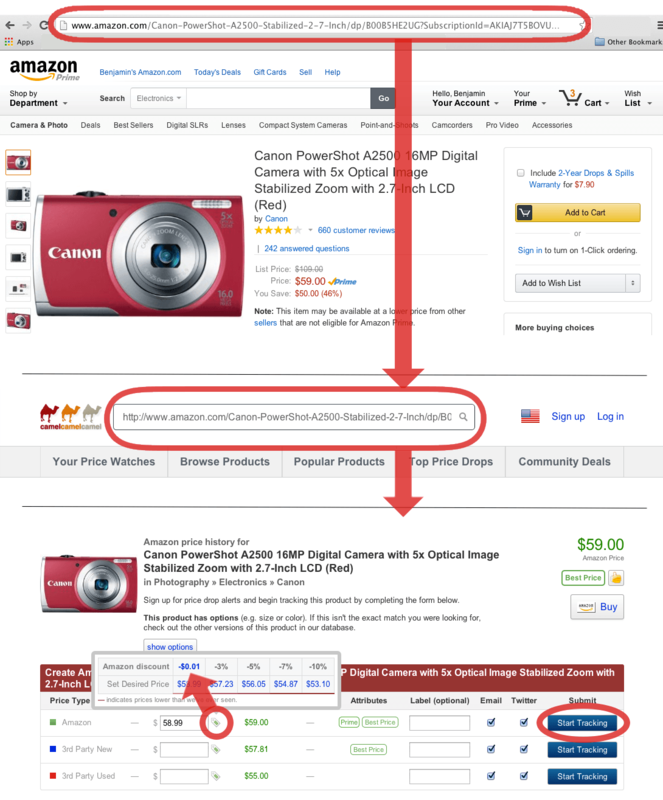 Follow these 3 steps to create your first price watch and be alerted when a product's price drops. 1. Find a product on Amazon. Copy the product's URL from your browser's address bar. 2. Go to camelcamelcamel and paste the URL from step 1 into the search bar at the top of the page and hit enter. 3. On the next page move your mouse over the price tag icon ( ) next to the price type you're interested in (usually Amazon) then click on the -$0.01 link in the window that pops up. Next click "Start Tracking" in the same row. You're done! We'll email you when the price drops!